Life-time discounts based on the number of orders. One-time discounts for large orders. Free title and bibliography pages. This review has not yet been approved by the owner of this writing service. If you are the webmaster of Paperwritings.com, please Contact Us to approve or remove this review. Although the design of the website is somewhat garish, most of the information is easily accessible and logically structured. Filler text is present, but does not make it difficult to browse for useful data as it is usually located separately from it. Price calculator, additional info about the service’s principles – everything is present. The service possesses a reasonably diverse pricing system: the price per page depends on the academic level, proximity of deadline and type of work. For example, writing from scratch ranges from $10 to $85. 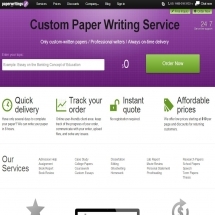 There is also admission writing, which is much costlier – from $41 to $128 per page. Other kinds of assignments (proofreading, problem solving, multiple choice questions) are evaluated differently, usually their prices are much lower. Support is available via e-mail and phone. Whatever method you use, the operators seem to be available most of the time and are quite helpful. Although there are some samples on the website, it is not quite clear on what conditions one can get an access to them, because you can only browse small excerpts free of charge, and frankly speaking, these are not very impressive. You can communicate with the writer directly via your customer panel. The service is average in all respects. Reasonably informative website, mostly helpful customer support (at least when it doesn’t come to difficult questions). Prices are generally very low – low enough to become suspicious. It is probably not the best idea to order anything too important here.